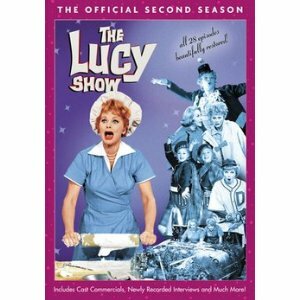 The recently released DVD set of the second season of the ‘60s sitcom “The Lucy Show” is one of my favorites of the summer so far based on the quality of the show itself and the terrific special features. I am very pleased as well that Paramount is one of the few remaining studios that still provides episode synopses and original air dates on most releases. “Lucy” is the second series starring Lucille Ball and her “I Love Lucy” co-star Vivian Vance. Ball is a widow with a young son and a teen daughter sharing a house with the divorced Vance and her young son. A typical plot has Ball scheming to have bank president Mr. Mooney, played by Ball pal and regular co-star Gale Gordon and is introduced in an early episode, advance money on the trust fund that he administers and that is Ball’s only source of income aside from her inevitably botched part-time jobs. Other plots have Ball and Vance attempting a DIY project with disastrous results. One such episode in which the pair tries to redecorate their living room is one of the best of the series and makes good use of the program’s transition to color from its first season in black-and-white. The rare episodes in which Gordon and Ball pair up are particularly interesting because Gordon is both usually the straight man and the target of the scheming of Ball and Vance. An episode in which Ball and Gordon use a fishing line with a magnet to try to retrieve an important contract is another classic from this season. The show is entertaining as well because it supports the theory that Ball insisted on upstaging Vance; the fact that the opening credits show numerous still photos of Ball and one small one of Vance is an example. It is obvious as well that Ball dresses better than Vance and is thinner. This topic also presents a good chance to comments on an e-mail from a reader in response to an earlier review in which I referred to a contract that required that Vance remain overweight. The reader told me that Ball revealed in a television interview of her and Vance that she had presented the contract to Vance as a joke. The best offering in the extraordinary extras is a full-length production of “The Lucille Ball Comedy Hour,” which CBS aired during the same 1963-64 year as the second year of “Lucy.” Lucy’s role as an actress who is the head of a studio is essentially Ball herself. The plot is that she recruits Bob Hope to play her husband in a special that is a thinly veiled commentary on Ball’s life with her then ex-husband and “I Love Lucy” co-star Desi Arnaz. This special is amusing but is more “Who’s Afraid of Virginia Woolf” than “I Love Lucy.” It also makes me glad that I never crossed Ball. Other extras include cast commercials, new interviews with some of the actors, and footage from specials. I would love to hear from fans of Ball and folks who can comment on backstage topics to which I referred; my e-mail is tvdvdguy@gmail.com.